The trophy is bigger than it looks in the picture. It is laser engraved on steel and it's fairly heavy. In addition to the logos of some of the match sponsors, it says "2nd. Senior" and NSSF Northwest Rimfire Championship"
Thursday morning I drove about four hours to Selah, Washington to my friend Larry's place, and we went out to the range in Moxee to do a little shooting. In particular, i wanted to put some rounds through my super radical custom Ruger 10-22 rifle to see if it still worked, and to sight it in a bit. The last time I had it out of the safe was almost exactly a year ago! Was I a bit rusty with it? That would be a very kind description! I got it sighted in, and also put some rounds down range with my High Standard Victor race gun. After shooting a bit, Larry and I swung by Cabela's to pick up some ammo, and then we grabbed a truly outstanding burger at Miner's Diner in Union Gap. If you are ever anywhere close to Yakima, WA. and are looking for a good meal, go find Miner's! It's worth going out of your way, it's that good. After dinner we grabbed some sleep, as we were heading out early Friday morning for the National Shooting Sports Foundation's Northwest Rimfire Challenge Championships being held in Parma, Idaho on Saturday and Sunday. We got an early start Friday morning, and it took us about six hours to get to Parma. We checked it at the motel, then headed over to the range to have a look. The stages were set up, but no pre-match practicing was allowed, so we looked and tried to figure out the best way to shoot each stage. There were 14 stages, and 7 plates per stage, and some were VERY small to shoot in a hurry! We would be shooting each stage 5 times, and our slowest time would be discarded. The other for would be totaled, and that was your score for that stage. 7 of the stages were to be shot with a rimfire rifle, and 7 of the stages were to be shot with a rimfire pistol. That's a lot of shooting over two days! On Saturday we put in a long and at times hot day, and completed 10 of the 14 stages. On Sunday we shot the remaining 4 stages. I knew I would be slow with the rifle since I never practice with it, so the plan was to try to be as accurate as I could, and not worry much about speed. With the pistol I figured I would try to push a bit harder for speed and try to make up a little for the slow rifle. Although there were a few bobbles, it went pretty much according to plan. By the end of the second day I was actually starting to feel comfortable with the rifle! I'm glad we didn't have to shoot any more stages on Sunday than four, as that was plenty, and I was getting tired. You couldn't ask for a better bunch to shoot with! After the shooting was over, we all gathered for the Trophy ceremony. Our squad did really well! Aimee was Top Lady, Ron won Open Overall, Larry won Senior Division, and I managed to end up right behind Larry in Senior division 2nd. place. Bill was 4th in Senior Division. Larry, Aimee, Bill, and Ron shoot their rimfire rifles almost every week in matches and/or practice, so finishing as well as I did was quite a surprise, considering I only shoot a rifle once a year! After the match a bunch of us got some dinner, then got to bed early, as Monday was going to be a long day. Larry and I were back on the road before dawn Monday morning, and by late afternoon I finally reached home, totally exhausted! It was a fun weekend!! South Whidbey Record on Mr. C.! 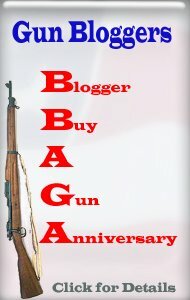 Free Ammo at The Gun Blogger Rendezvous?